This new and unique tour explores the north and western part of Malaysian Borneo, with special emphasis on photographing some of the unique herpetofauna, iconic mammals and fascinating flora found only on this island. We have handpicked some of the best-known locations, but will also venture to a couple of remote habitats on the edge of civilization. We will cross the tracks of the Sunda Clouded Leopard and if we are lucky may even get a sighting. Other target species include the many amphibian species in Sarawak, such as one of the world’s smallest frogs, and at the opposite end of the spectrum, the largest flower on the planet – the Rafflesia. Additional highlights comprise of the endemic big-nosed Proboscis Monkey and the endangered Bornean Pygmy Elephant of Sabah. Naturally, in these special habitats, we will encounter a very diverse range of animals and plants, with the help of our experienced private guides with the additional benefit of Des, being a Malaysian born, to help ensure we get the best support and focus throughout what will be a truly amazing adventure as well as photographic opportunity. Day 1: Upon arriving at Kuching International Airport (KCH) on the island of Borneo, you will be greeted and transferred to a comfortable local hotel. There will be no time for rest as immediately after dinner, we will be taken from our hotel to a 2,230 hectare protected area of mixed dipterocarp forest that is rich in palms, orchids and pitcher plants. Situated on a small sandstone plateau, the land is punctuated with bands of hardened limestone that have created a number of clear streams, waterfalls and bathing pools. This habitat supports over 60 species of frogs, including one of the smallest species in the world – the Matang Narrow Mouth Frog (10-12mm). This pea-sized amphibian lives around and inside the carnivorous pitcher plants! 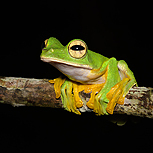 We will gently climb a small hill in order to reach a natural frog pond where you will be presented with the opportunity to photograph species such as the File-eared Frog, Bornean Horned Frog, Wallace’s Flying Frog, Harlequin Tree Frog, and many more. Day 2: We will set off early this morning to explore another national park. This time we will hope to see the world’s largest flower, the Rafflesia. We will jungle trek in search of this unique blossom. The guide will point out the host vines, the cabbage-like Rafflesia buds that litter the forest floor, and if we are lucky, a Rafflesia in full bloom. We will then head back to the hotel after a quick lunch at a local coffee house in afternoon. Please note the Rafflesia only blooms occasionally and therefore sightings are never guaranteed. Our guide will be in contact with the park authorities so we will be informed if there are flowers in bloom. If this is not the case, then we may choose to spend the day visiting another national park during the day. We will decide once we are on the ground. In the evening we will once again head out in search of herptiles at the previous location. On the way up, we will look out for frogs on the side of the road and other nocturnal wildlife in the forest. Day 3: We will leave early in the morning and drive to a reservoir, a set off point for our next destination. We will stop at a small town and visit the local market and have an early lunch in a local coffee house, before arriving at the lake. We will then hop on a traditional Iban (native tribe) longboat and meander upriver to a remote village, deep in the forest. After settling into our jungle lodge, we will have a wholesome dinner, before going out for an evening of photography. If the conditions are right, we will be walking in the cool, shallow stream in search of amphibians such as the bright orange Cinnamon Tree Frog and the miniature but incredibly loud Dring’s Litter Frog, plus other nocturnal wildlife such as a resting Reticulated Python and the impressive Orang-fringed Tarantula that are sometimes found by the riverbank. Day 4: Following breakfast, we will hike the jungle trails along the river to look for wild Orangutan and other interesting inhabitants of the forest, such as the long-tailed Paradise Flycatcher. We will later meet up by our longboats again and head further up the stream and eventually stop at a scenic waterfall. Here, we will have a hard-earned rest and a quick dip in the waterfall and relax, while our Iban hosts rustle up a BBQ lunch on an open fire. We will be taken back to the lodge afterwards to take stock of what we have achieved thus far in the journey. After dinner, we will have another exciting session of night walking. Day 5: We will have a leisurely breakfast this morning before heading downriver and onwards to Kuching with lunch en route. We will check in to our comfortable hotel late afternoon. Day 6: We will be transferred to the airport this morning to catch our onward flights to the northeastern part of this magical island. The state of Sabah is very different to that of Sarawak on the west. The climate here is usually drier and the infrastructure is more developed. After a couple of internal flights, we will be picked up by our local guide and dropped off at our lovely lodge, set right against the rainforest. You can relax by the pool or we can head out for a short jungle walk. At dusk we will have our dinner on the open deck, where we are likely to see the acrobatic display of the resident Flying Squirrel, gliding across tens of meters in the air from its roost to the surrounding trees in search of food. Day 7: After an early breakfast, we will drive to a small private reserve by the mangroves. This privately run sanctuary is located within an oil palm estate and offers a unique chance to see Proboscis Monkeys up close. These monkeys are totally wild but habituated which allow for fantastic photography. There are two feeding platforms here at different times and we will do both sessions with lunch in between at a nearby restaurant. Day 8: We will have an early start this morning, as we need to be at a 30m high rainforest canopy walkway in time to see and hear the 250 species of birds found in this special patch of rainforest, such as the Bornean Bristlehead and the colourful Fiery Minivet. A number of these are canopy species that rarely venture down at ground level so we will be at a great vantage point. After lunch, we will be transferred to a boat jetty in town. We will then cruise up the mighty Kinabatangan River, passing pristine mangrove forests and interesting wildlife. We will arrive by our river lodge in the afternoon. There are a few established nature boardwalks linked to the lodge where we are free to explore. There are a number of interesting subjects if you spend the time, from the bizarre looking Lantern Bug to the characterful jungle Bearded Boars. After the tropical sun has lost some of its intensity, we will cruise downriver in search of the rich and diverse wildlife that lives along this important river. Shortly after dinner, we will head out once again in search of owls and other nocturnal wildlife. Days 9 – 10: Over the next couple of days, we will take to the boats to penetrate areas of the jungle that are inaccessible by road. Daily cruises will explore the river, spotting all manner of creatures, including the endangered Pygmy Elephants, different species of Hornbills, crocodiles and a myriad of other animals. With our own guides to spot and a boatman dedicated to our needs, the possibilities are endless in this species-rich habitat. And if that is not enough, there will also be night cruises to take in the glittering fireflies, colourful roosting birds and other nocturnal inhabitants of the jungle. Days 11 – 12: Back on land, we will travel by road to visit a special nature reserve set within a pristine primary rainforest. Staying in a luxurious rainforest lodge, we will be trekking by foot to see the rich abundance of creatures the ancient forest support, such as Orangutan and Red Leaf Monkey, Slow Loris, Sunda Leopard Cat, Western Tarsier and many more. Again, night safaris are another highlight, by foot and by car, to experience the nocturnal animals. We will also have the opportunity to have a spectacular birds-eye view of the rainforest at dawn with rising mist atop a 300m suspended canopy walkway. Day 13: We will have the morning to ourselves at this wonderful location before we take a scheduled transfer out of the forest. It will take us a good few hours to get back to civilisation. We will then check in to our comfortable hotel in town for the night. Day 14: Depending on your flight, you will be transferred to the airport for your homebound journey. Accommodation, all local transport including internal flights, park entry fees, and all meals. All accommodation on this trip is of good standards with electricity and most comes with air-conditioning. Most of the treks are not strenuous although the heat and humidity might be uncomfortable for some. We could walk up to a couple of miles a day but this will not be continuous as we will be stopping along the way to photograph different subjects. The terrain is mostly flat but uneven. There are a couple of locations where it is hilly and hiking can be a little strenuous. In this case we will take it slow and steady.